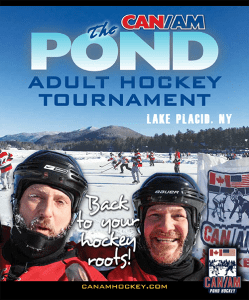 The recent cold snap made plenty of ice around the Adirondacks and there is no better place to lace up the skates than at the annual CanAm Pond Hockey tournament in Lake Placid, with its more than 20 rinks cleared across Mirror Lake. 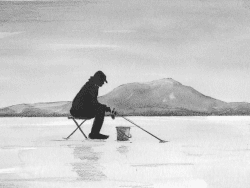 A pond hockey game brings back the simplicity of the winter sport and no better place resonates with fans of the game like the hometown of the 1980 Miracle on Ice. The CanAm Hockey Tournament celebrates the spirit of hockey this weekend January 25-27, 2019 with age divisions as well as women’s open and co-ed open divisions. This annual pond hockey tournament is only open to adults, but spectators of all ages can have fun watching the games. With the addition of a plowed skating loop, spectators can walk or skate around the rinks to see the action up close and personal. Even if you didn’t grow up playing hockey, watching a pond hockey game on Mirror Lake inspires a free and youthful spirit, surrounded by a beautiful High Peaks backdrop. Each team consists of six people (with no goaltender). Anyone can form a team and enjoy the competitive structure, but pre-registration is required. Teams play two games Friday and Saturday with playoffs on Sunday. It’s an open format that is not broken down into skill levels. Awards are given out for the different age groups. The benefit to Lake Placid’s location is the close proximity between accommodations and the ice. Everything is within walking distance making it appealing for members of the family not playing (keep in mind that all warming tents are for the players, so dress for the weather). So come out and cheer for the Red, White, and Blue, or our neighbors to the North. It’s all good international relations.